Mad scientists, or just misunderstood? Either way, Dr. Gloom has created a machine that brings to life creatures from imagination—or nightmare—which will help him be king of the mad scientists. Or something. It doesn’t matter. 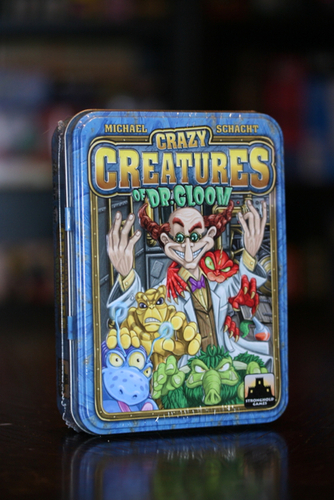 All you need to know is that The Crazy Creatures of Dr. Gloom is a neat little card game from designer Michael Schacht. It follows the same pattern of so many of his designs: simple, interesting choices. This one is particularly good for families. 48 Creature Cards in 4 different colored “suits”—or, monsters—numbered 1 through 6, and there are two of each of those numbers. In addition to the color differences, the monsters are different types, so they’re easy to distinguish. 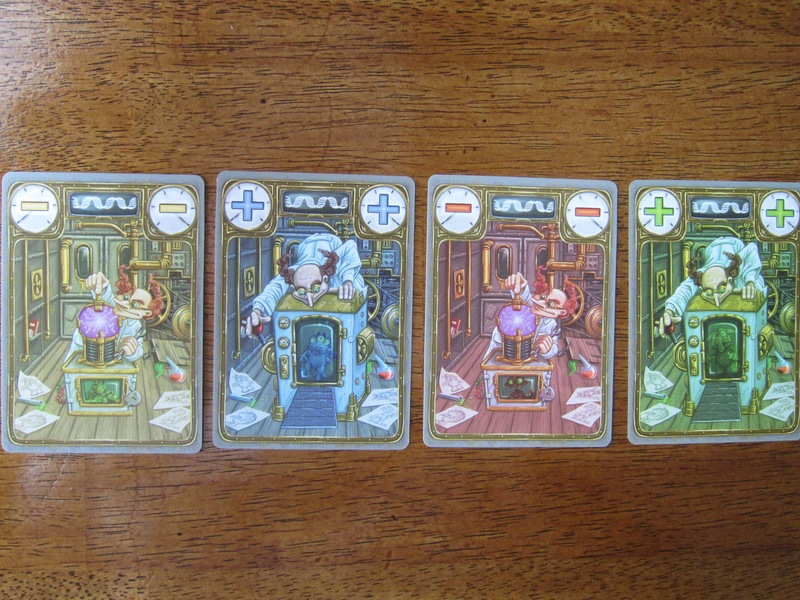 4 Monster Machine cards—one in each of the colors. These are double-sided with a “+” symbol on one side, and a “-” symbol on the other. 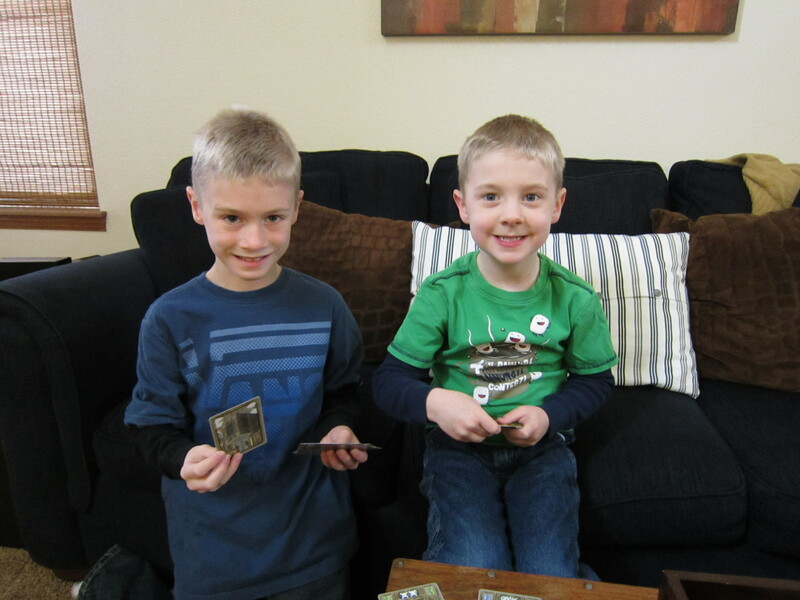 First you place each of the four Monster Machines on the table—with the “+” side up. Then you shuffle up all of the Creature Cards and deal them out to the players—the number depends on the number of people playing. You also create an 8-card deck of extra creatures that is set aside—and then later played exclusively on Dad! 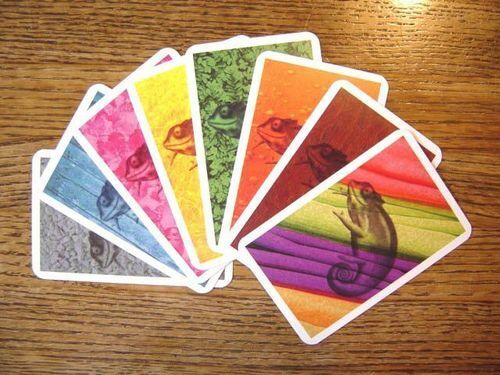 You’ll play a number of rounds equal the the number of players, and each round plays exactly the same: on your turn you’ll either play one card or pass. The first card played on any of the machines can be of any value. From that point on, any cards played have to follow the current “rule” of the Monster Machine: equal to or lower than the previously played card if the Machine is on the “-” side, and equal to or higher than the previously played card if the Machine is on the “+” side. The 5 and 1 cards are special. They have a “mutation symbol” on them. So while you can play a 1 on a 1, or a 5 on a 5, you can also “wrap around”—again, depending on the Monster Machine’s orientation at the time. So if it’s on the “+” side, and there’s a 5 down, you can play a 1 on top of it—or a 1 on a 5 in the case of the “-” side. This kind of…unsticks the machine if it’s maxed out at the highest or lowest number, and there’s no way to flip the symbol. So how do you flip the symbol on the Monster Machine? 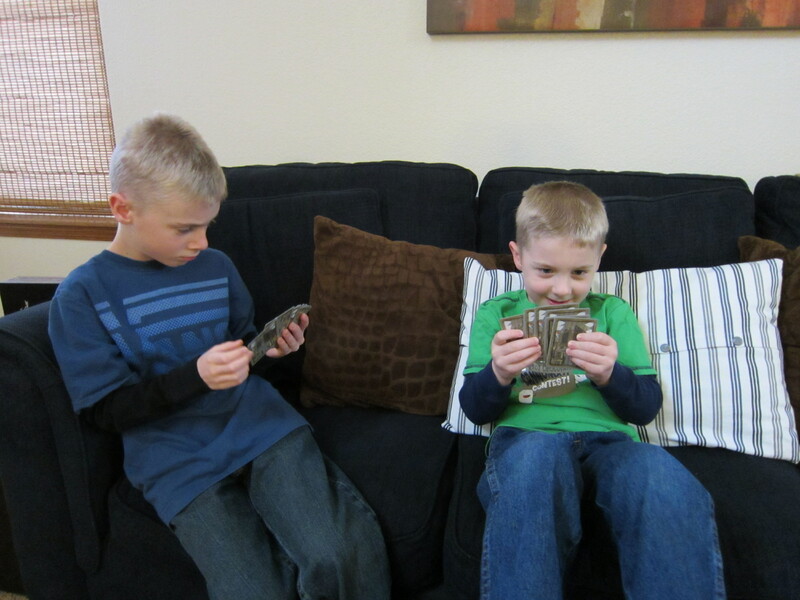 Flip one of the Monster Machines to the other side (it doesn’t have to be the same machine you just played a card onto). Force someone (usually Dad!) to draw one of the cards from the extra stack of monsters you put aside at the beginning of the game. This is a way to slow down someone who seems to be winning, or who is about to end the round by going out. Once that stack of 8 is gone, you have to flip a machine. So players either play a card, or pass if they’re unable to play a card. It could be that you pass on this turn and then, because of cards played after you, you’re able to jump back in. The round ends if everyone passes because they’re unable to play onto one of the machines, or if someone plays the last card from his or her hand—in which case, everyone else gets one final turn to play a card, if possible. 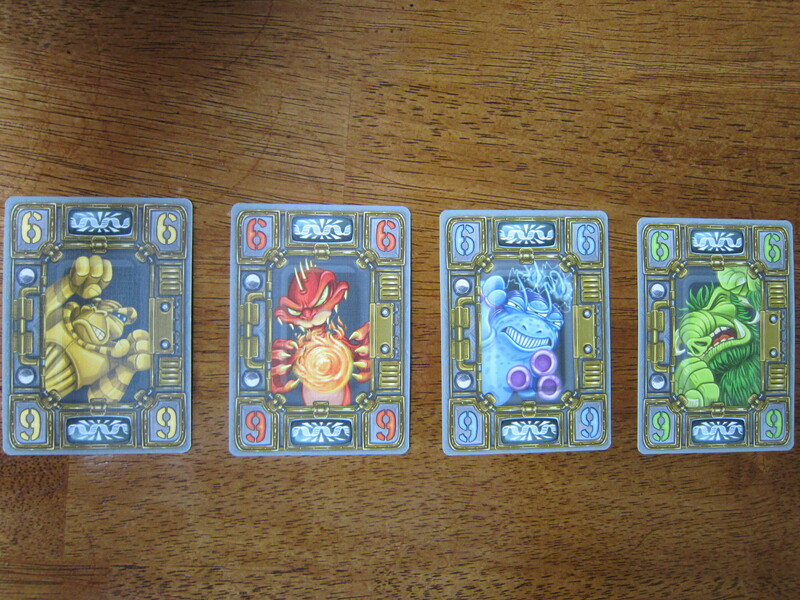 Each Creature Card has 0, 1, or 2 skulls on the top, which represent penalty points. (1’s and 6’s have no points. 2’s and 5’s have one. And 3’s and 4’s have two.) Everyone who didn’t go out adds up the penalty points that remain on their cards. If someone happens to have no Creature Cards left, that person subtracts 3 penalty points from their score. Then you play another round just like the last, until you’ve played as many rounds as there are players. Whoever ends up with the fewest penalty points wins. The Goofball Brothers enjoying this game! Family Game? Definitely! 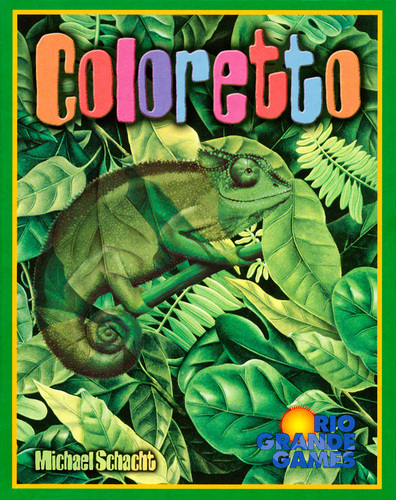 I can’t tell you how much I love that my 5-year-old can play this. And there’s enough fun play that the 8-year-old loves playing, too. It’s squarely in the small realm of games my whole family can—and likes to—play. Youth Group Game? Under the Right Circumstances! Maybe preteen or junior highers, but I’m not sure senior highers would like this. Gamer’s Game? Nope! It’s a filler, but not one I’d bring to game night. It’s not like there’s anything to dislike here, it’s just that there are deeper fillers out there, and my game group would rather play those. As a family game—which is how I’ll be playing this 99% of the time—it gets an enthusiastic thumbs up. My kids like it. My wife likes it. I like playing it with my kids and my wife—everybody wins! Plus it gives them a chance to gang up on Dad and hand him extra Creature cards. And who doesn’t like that?! Besides me, of course. Thanks to Stronghold Games for providing a review copy of Crazy Creatures of Dr. Gloom, which did not in any way affect my opinion of the game. You can get the Crazy Creatures of Dr Gloom on Amazon here.